The Twelfth Amendment (Amendment XII) to the United States Constitution provides the procedure by which the President and Vice President are elected. It replaced the procedure of the Electoral College under Article II, Section 1, Clause 3, which demonstrated problems in the elections of 1796 and 1800. The Twelfth Amendment was proposed by the Congress on December 9, 1803 and was ratified by the requisite number of state legislatures on June 15, 1804. The Electors shall meet in their respective states, and vote by ballot for President and Vice-President, one of whom, at least, shall not be an inhabitant of the same state with themselves; they shall name in their ballots the person voted for as President and in distinct ballots the person voted for as Vice-President, and they shall make distinct lists of all persons voted for as President, and of all persons voted for as Vice-President, and of the number of votes for each, which lists they shall sign and certify, and transmit sealed to the seat of the government of the United States, directed to the President of the Senate;--The President of the Senate shall, in the presence of the Senate and House of Representatives, open all the certificates and the votes shall then be counted;--The person having the greatest number of votes for President, shall be the President, if such number be a majority of the whole number of Electors appointed; and if no person have such majority, then from the persons having the highest numbers not exceeding three on the list of those voted for as President, the House of Representatives shall choose immediately, by ballot, the President, the votes shall be taken by states, the representation from each state having one vote; a quorum for this purpose shall consist of a member or members from two-thirds of the states, and a majority of all the states shall be necessary to a choice. And if the House of Representatives shall not choose a President whenever the right of choice shall devolve upon them, before the fourth day of March next following, then the Vice-President shall act as President, as in the case of the death or other constitutional disability of the President.--The person having the greatest number of votes as Vice-President, shall be the Vice-President, if such number be a majority of the whole number of Electors appointed, and if no person have a majority, then from the two highest numbers on the list, the Senate shall choose the Vice-President; a quorum for the purpose shall consist of two-thirds of the whole number of Senators, and a majority of the whole number shall be necessary to a choice. But no person constitutionally ineligible to the office of President shall be eligible to that of Vice-President of the United States. The Twelfth Amendment (Amendment XII) to the United States Constitution provides the procedure by which the President and Vice President are elected. It replaced the procedure of the Electoral College under Article II, Section 1, Clause 3, which demonstrated problems in the elections of 1796 and 1800. 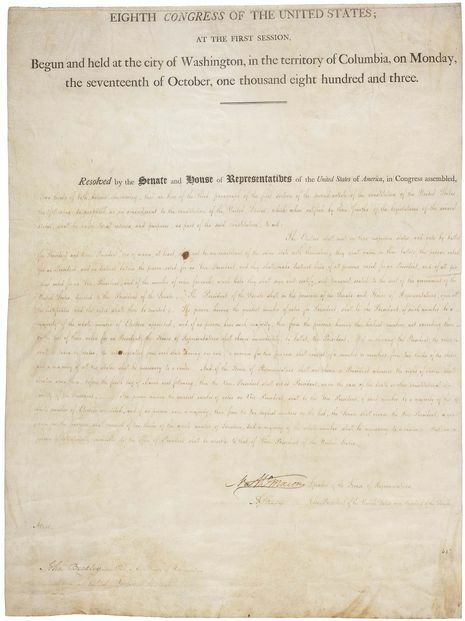 The Twelfth Amendment was proposed by the Congress on December 9, 1803 and was ratified by the requisite number of state legislatures on June 15, 1804.